Pull System - trigger supply based on actual consumption. Replenishment - supply the minimum necessary amount to protect availability during the replenishment lead time. Aggregation - placing inventory in the right place to significantly reduce the amount of inventory required to protect against consumption variability. 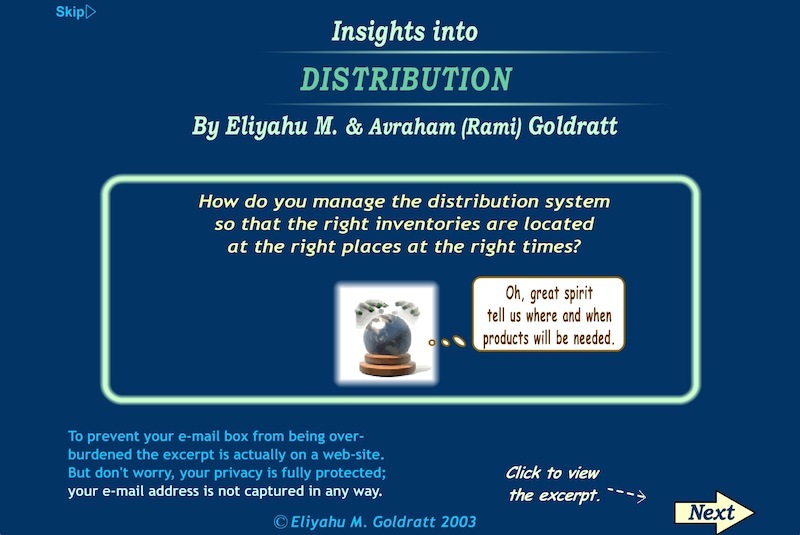 An extensive explanation of the Theory of Constraints (TOC) analysis and solution to manage a distribution supply chain to maximize availability with less inventories. SIMPLE & common sense procedures to change from a push to a pull system to ensure availability at point of sale, while significantly reducing inventory levels. You must have an ACCESS KEY to register and install each TOC Insights. Each TOC Insight is a separate downloadable file. 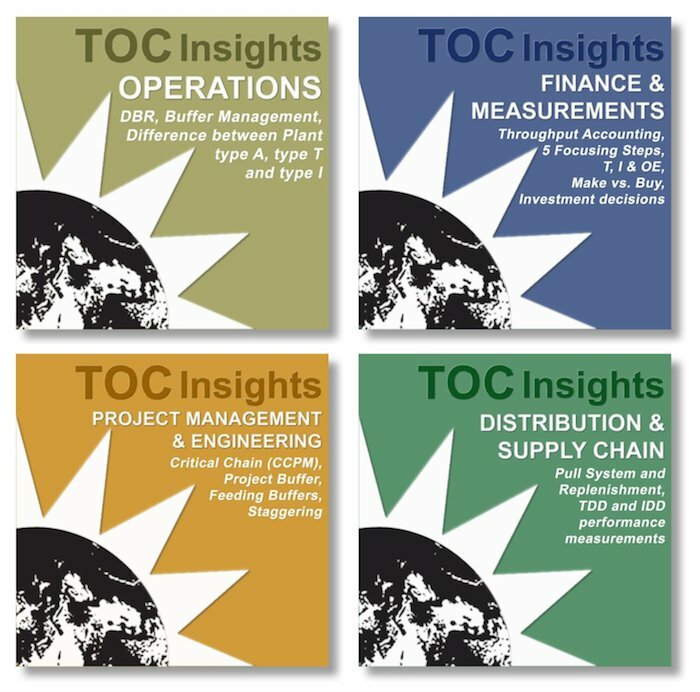 You may download the TOC Insights as many times as you want. The program is zipped. You should use an Unzip utility to extract the program. The downloadable version can be installed in two different computers by you. Please click here to review the license agreement for these products. An internet connection is required only for initial registration/installation and future un-installation. Additional installations or upgrades may be subject to additional charges. Web Version - view the TOC Insights from the web (on our server) for 1 year starting from the first day you access the session(s). Downloadable Version - the downloadable version of TOC Insights allows you to download the files onto up to two computers (Windows) for your personal use and viewing for unlimited time. Client-Server Application - allows users to access the TOC Insights through a Local Area Network. The TOC Insights will reside on a local server and a "client" (user) will be able to access the session(s). 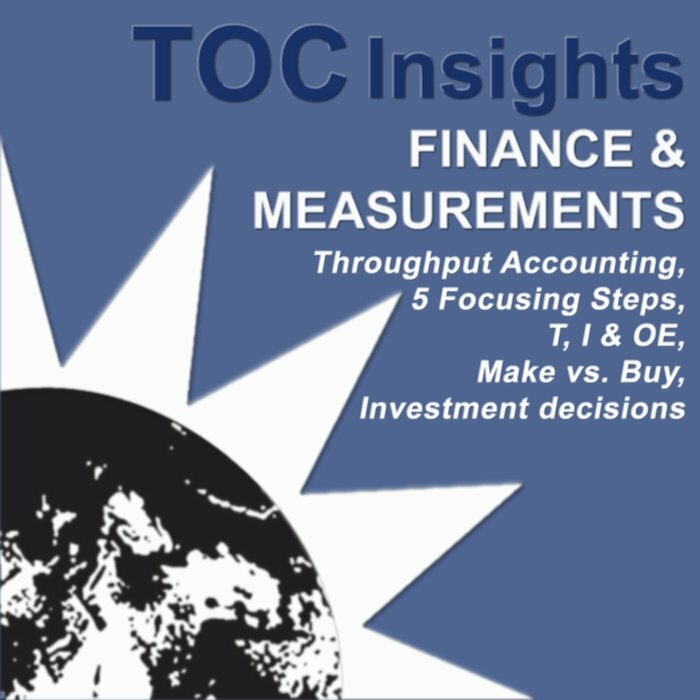 Each client computer requires one non-concurrent license per TOC Insights session. The Client Server Application starts with 10 licenses for one session or for each of the 4 sessions. An unlimited number of licenses can be made available. The TOC Insights must be downloaded and installed first. The internet connection is required only for download and the initial installation. Once the program has been installed, the internet connection is no longer required. Installation requires a valid Access Key, which is provided upon purchase of the product. The user can download, install and use any available language anytime on the same computers. Every language needs to be installed using the same login information and Access Keys.